Radox handwash with thyme and tea tree oil scents inspired by nature's finest ingredients. 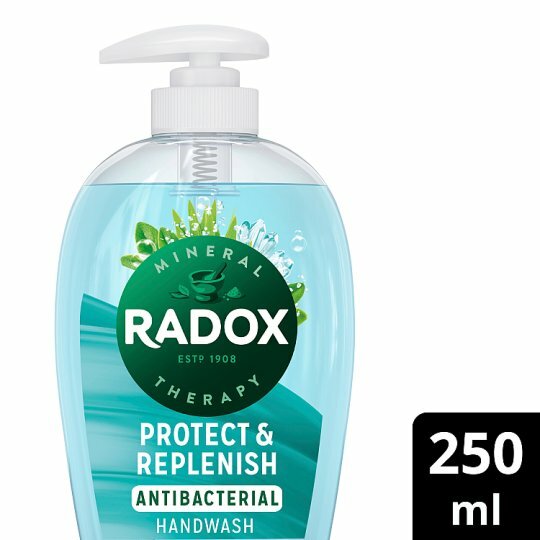 Enjoy feeling hygienic and replenished with Radox Antibacterial protect + replenish liquid handwash. Using this protective antibac hand soap and scented liquid handwash, cleanses your skin and makes you feel clean. This antibac hand wash is suitable for all skin types. Hand soap suitable for daily use. For best results, pump out handwash, lather on hands and rinse with warm water. Antibacterial hand soap is pH: skin neutral, dermatologically tested and suitable for all skin types. At Radox, we have been taking inspiration from nature’s incredible fragrances since 1908 to create refreshing shower gel, hand wash and bath products. We then capture their transformative effects with one goal in mind: to help people get in the mood they want to be in. Smell is not only one of the most important senses, but one of the most overlooked. Fragrance has the power to lift you when you’re down, to awaken you when you rise, to make us sleep, love, create, dream. It has the power to genuinely transform how you feel. In fact, there's hardly a mood in society that cannot be moved by fragrance. And there’s barely a person on earth who can’t be affected by the right scent. Hand wash with nature inspired fragrance to transform your mood.